Tyehimba Jess reading leadbelly’s lessons live at the Donald B. MacMillan House, Bowdoin College, September 7, 2006. Tyehimba Jess reading sallie ledbetter: a mother’s hymn live at the Donald B. MacMillan House, Bowdoin College, September 7, 2006. Tyehimba Jess reading mistress stella speaks live at the Donald B. MacMillan House, Bowdoin College, September 7, 2006. Tyehimba Jess reading bud russel, louisiana prison transfer man, 1920 live at the Donald B. MacMillan House, Bowdoin College, September 7, 2006. Tyehimba Jess reading sing out live at the Donald B. MacMillan House, Bowdoin College, September 7, 2006. 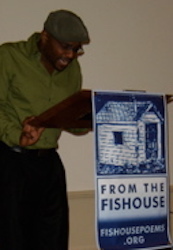 Tyehimba Jess reading freedom live at the Donald B. MacMillan House, Bowdoin College, September 7, 2006.